beni imo Archives - Kampai! : Kampai! 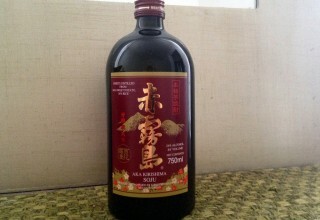 Posts tagged with "beni imo"
Kuro Isanishki has the unmistakable earthy nose of an imo shochu. This yields to a buttery soft mouthfeel. Surprisingly supple given what's in store otherwise. An extremely light sweetness yields to a very dry, tight finish. The dryness would overwhelm except the soft mouth provides enough mellowness to create an interesting contrast. Kagura no Mai, with its plain black and white label with abstract drawings of village life, doesn't shout from you off the shelf. Nor does is grab you out of the glass. It's light and clean with the forward aromas of sake yeast. This leads me to believe it's a low pressure distillate and that the distillery has chosen to use a traditional sake yeast rather than one of the more neutral shochu yeasts.